Franchise owners thrive on the same skills pro athletes learn: speed, versatility and great coaching. It’s hard enough to squeeze a dozen people into the prep room of a sub shop. It’s even tougher if they’re all NFL players. But that’s who’s wedged between the refrigerator, the bread oven, the meat slicer and cartons of ingredients in the back of a Jersey Mike’s franchise in a strip mall on the fringes of Ann Arbor, Mich., just after the lunch rush. The men are students at the NFL Business Academy — a program, run out of the University of Michigan’s Stephen Ross School of Business, that teaches franchising and entrepreneurship to help prepare players for the often rocky transition to life after pro football. The questions come next, and they’re well-informed and pointed. Minnesota Vikings punter Ryan Quigley wants to know the cost of food that goes bad, and how it’s factored into the accounting. Bills running back Patrick DiMarco asks if it’s better to buy an existing store or start from scratch, and to lease or own the underlying property. After the session, the players applaud the sub shop workers and head back to the bus. The next stop? An Orangetheory Fitness franchise. Back on campus, the students — including Atlanta Falcons defensive end Ben Garland, Kansas City Chiefs running back Spencer Ware and former Tennessee Titans linebacker Stephen Tulloch — dutifully fold themselves behind the tiers of desks in a lecture hall and settle in. They spend three 10- to 12-hour days here, listening to faculty, entrepreneurs and former colleagues who started business ventures of their own, such as onetime St. Louis Rams linebacker David Vobora. They’re anticipating (or, in the case of Tulloch and a few other retirees, experiencing now) the tough slog that comes for athletes when they put away their uniforms and close their lockers for the last time. Rich, famous and at the top of their sport, many find themselves fumbling that adjustment. Sixteen percent file for bankruptcy within 12 years of leaving the league, according to researchers at CalTech, George Washington University and the University of Washington. This despite earning a median $3.2 million during their typical six-year pro careers — more than twice what most Americans make in their lives. Separate reporting by Sports Illustrated suggests the percentage of former players under financial stress is 78, and that 60 percent of former NBA players go bust. The academy started as a collaboration between the league and the NFL Players Association, to address this very problem. It began at the University of Pennsylvania’s Wharton School of Business and later moved around — making stops at Harvard Business School and Northwestern — before settling in five years ago at Michigan’s Ross School, named for Michigan benefactor, real estate magnate and Miami Dolphins owner Stephen Ross. Now it runs during the players’ off-season and the university’s winter break. Some 650 players have enrolled in the voluntary program over the years, the NFL reports; some have since launched or expanded companies or foundations or gone back to actual college, the league says. A little extra help doesn’t hurt, however, especially for guys who are behind at the proverbial half compared to people who have been in business since they graduated college. That’s why franchising plays such a big part at the academy. Athletes gravitate toward franchises. That’s where a surprising number of them invest their pay. Four-time Pro Bowl guard Max Montoya (Cincinnati Bengals, L.A. Raiders) owns six Penn Station East Coast Subs locations. Former offensive lineman Ron Stone (Dallas Cowboys, New York Giants, San Francisco 49ers, Oakland Raiders), defensive end Raheem Brock (Indianapolis Colts, Seattle Seahawks) and three-time Super Bowl winner Willie McGinest (New England Patriots, Cleveland Browns) all have opened Wingstop restaurants. Super Bowl winner Keyshawn Johnson (New York Jets, Tampa Bay Buccaneers, Dallas Cowboys, Carolina Panthers) has Panera Bread and Cold Stone Creamery franchises. 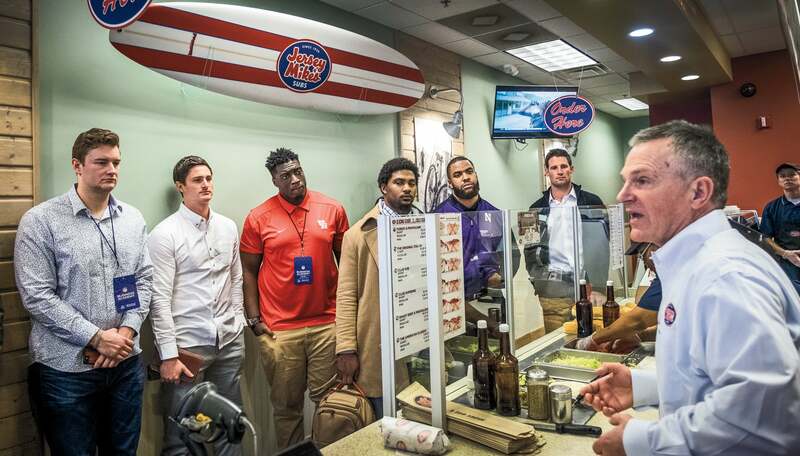 And New Orleans Saints QB Drew Brees — an NFL Business Academy alumnus — has a bunch of Jimmy John’s Gourmet Sandwiches shops and is a partner in a franchise called Walk-On’s Bistreaux & Bar, with 17 locations and seven more planned. And that’s just football. It’s not only that these guys like fast food, although several have enthusiastically pronounced themselves longtime fans of it since their college playing days. There are other reasons that make franchising such a good fit for pro athletes. Two of the franchisors that leverage this the most are Jersey Mike’s and Orangetheory Fitness, both of which count former pro athletes among their franchisees. Linebacker and former Pro Bowler Brendon Ayanbadejo (Baltimore Ravens, Chicago Bears, Miami Dolphins) took a class at Orangetheory a few days after his Super Bowl win in 2013 and opened his own a year later. Now he has a dozen in California, with a goal of more than doubling that. Ex-defensive lineman Mike Golic (Houston Oilers, Philadelphia Eagles, Miami Dolphins), the former cohost of ESPN’s Mike & Mike, owns several Orangetheory studios around Boston. Linebacker Ned Bolcar (Seattle Seahawks, Miami Dolphins) is a multi-unit Orangetheory franchisee in Pennsylvania and former pitcher Chris Narveson (Miami Marlins, Milwaukee Brewers, St. Louis Cardinals) owns Orangetheory franchises in and around Charlotte, N.C. Former linebacker Angelo Crowell (Buffalo Bills) opened a Jersey Mike’s near Florida State University and now has a dozen of them, with five more planned. Baltimore Ravens defensive tackle Carl Davis is here for the same reason. He runs a nonprofit called the Trenchwork Foundation in his hometown of Detroit that promotes education and health among kids, and provides them school and sports equipment. Teammate Willie Henry, who’s also at the business school, is on the board. That’s what Vobora learned, after his early missteps.